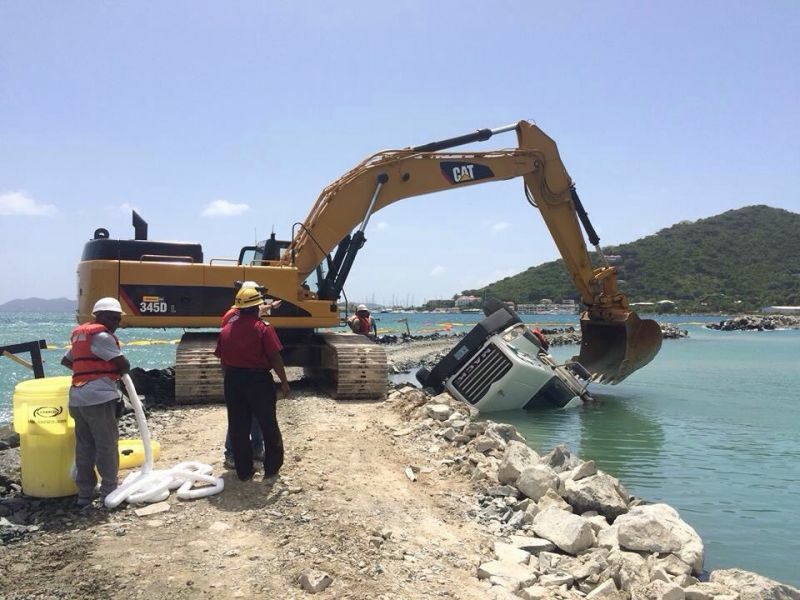 ROAD TOWN, Tortola, VI - Health, Safety, and Environmental Manager for the IDL-Meridian project Mr. Matthew D. Trousdell said that the onsite crew acted quickly to get Calvin ‘Duck’ Smith out of the truck he had been driving which had overturned into the water on Monday October 6, 2014. In an email to this news site today October 8, 2014, Trousdell gave the official incident report on behalf of the contracting firm for which he spoke. “First and foremost, Duck came out of this incident without any injury and we have to commend our onsite crew for acting swiftly to get him out of the truck,” said Trousdell to this news site. “Over the past six weeks we have had ten trucks delivering ten loads of rocks per day to a total of 955 loads without any issues. Duck was on his third delivery when the incident occurred,” said Trousdell. The official company report on the incident stated that the driver drove the truck too close to the downward slope. “In an incident that took place on October 6, during the revetment works undertaken by IDL-Meridian as part of its cruise pier expansion contract, Calvin ‘Duck’ Smith, manoeuvred the truck he was driving too close to the downward slope of the revetment and at such an angle that caused the weight of the truck to topple the vehicle into the water,” said the report. “Mr. 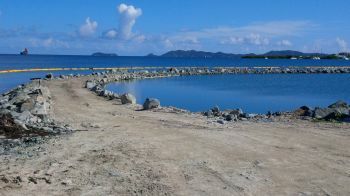 Smith is a long time driver for Tortola Concrete Limited, a company contracted by IDL-Meridian to supply and deliver the rocks for the revetment works,” it said. “The onsite crew acted quickly to pull Mr. Smith out of the truck after which he was taken to Peebles Hospital for assessment. Mr. Smith did not sustain injuries but was held for observation before being discharged the same afternoon,” the report said. It said that an oil spill boom was deployed and this prevented the spread of the leaked engine oil from the truck. “The vehicle was recovered quickly from the waters and the collapsed portion of the revetment was reconstructed with additional width allowance. The effect on the progress of the revetment works was minimal and activities were resumed within an hour and half of the incident,” the report from IDL-Meridian said. 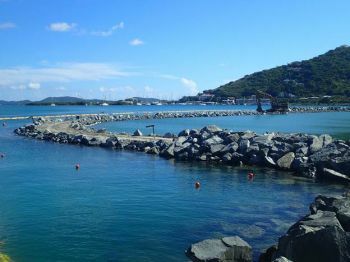 It explained that the revetment – or reclamation berm – is a sloping structure designed to absorb the energy of the waves and water. 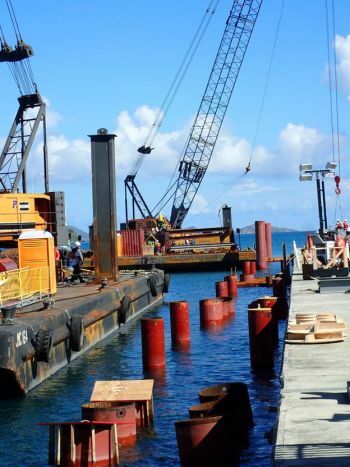 “The revetment creates the outer wall for the reclaimed land that will provide parking for the expanded cruise pier,” it explained. 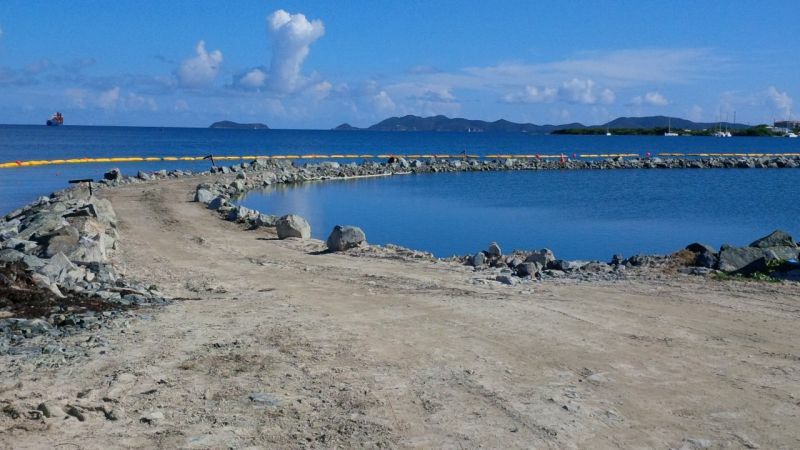 The report said that construction of the revetment involves the placement of a submerged, protective curtain to control turbidity escape prior to placing a wall of rocks around the designated reclamation area. “The rocks are delivered by trucks and are then arranged by heavy machinery to form a solid berm. The width of the track for the trucks and other machinery used to construct the berm is in excess of 16 feet,” the report said. It said also that once the revetment has been completed, channel dredging will commence. 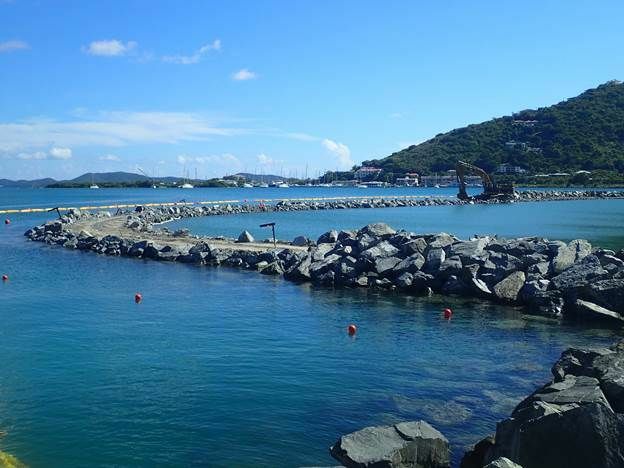 The dredging is required to facilitate entry and maneuverability of the cruise ships and the dredged material will be used as fill for the land reclamation. 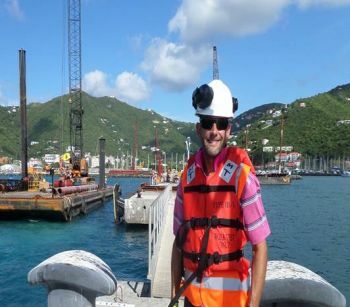 These works are being undertaken at the same time as the cruise dock expansion works, the report said. 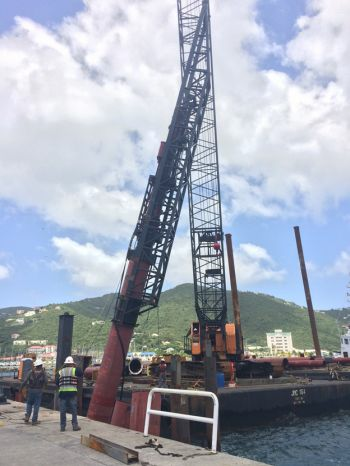 ROAD TOWN, Tortola, VI – Calvin Smith aka 'Duck', the driver of a heavy duty truck servicing the Cruise Pier Development Project work site today October 6, 2014 misjudged his manoeuvre causing the vehicle to topple sideways into the water. The driver is said to have escaped with cuts and bruises and had to be taken to hospital for treatment. “The driver was doing a routine dump, he misjudged the corner and weight of the truck turned it over,” said a source on the site, speaking to Virgin Islands News Online today. “We haven’t gotten an official assessment from the hospital as yet,” said the source when asked about the fate of the driver of the hapless vehicle. “But we understand he is not in critical condition, just some minor cuts and bruises,” the source said. “Further information will be provided after we would have done our official assessment,” said the source with which this news site spoke. Public Relations Officer of the Royal Virgin Islands Police Force (RVIPF) Diane Drayton confirmed with this news site that the Police are investigating the incident. She said that she could not release the name of the driver because of the fact that the investigation is ongoing. It is unclear how the incident will affect the pace of the ongoing works. ROAD TOWN, Tortola, VI – Moments ago today October 6, 2014, one of the heavy duty trucks working on the Cruise Pier Development Project site in Road Town fell into the ocean while delivering materials. It is reported that the person involved in the accident had to be hospitalized. Work is ongoing to bring the vehicle up from the water. This news site will bring you more details as they become available. Man you so wicked minded to say that. This was a private vehicle used by someone who is not related to Government issues. The guy could have died!!! and here you go with your poor class judgement. Hope it is insured against the ravage of sea water. Hope there is a ready replacement. NDP BAD LUCK JOMBIE FOR AYO! I heard they all went on a trip to get things in place but God don't sleep. A set of wolves in sheep clothing. See now if NDP wasn't harden..this truck wouldnt fall in the water and ppl wouldn't get hurt..NDP turning the place over, one truck at a time...LOL (sarcasm). Hope the driver is doing ight now. Apparently Brad Pitt is here though. Ope no, wait, it's just me. 4000 more people added to the beaches? yeh, I'm sure visitors want to see that. YOU ARE PLAIN OUT STUPID!!!!!! You pay 8% in taxes and want a return? WTF? He was looking fish soup? He was looking your mother. Hope he was not drinking. Have they address health and safety on this major project? Have they address your mother yet? Just stfu!!! You are stupid. My Lord!!! Do you know that each construction project is comprised of a quality control plan, project management plan and a health and safety plan. It looks like all you can do is point fingers at someone's mom. I hope you know how your mother is getting food on the table and clothes on her back. I can not believe the mentality of some of the people who live in our beautiful BVI. An accident occurs and instead of showing concern some chose to show their stupidity and turn it in to a free for all to criticize and make it political. No wonder our country can't get any better! Shame on those to do this!! Vino, let me see if you will post this. Just a thought. I may be wrong, but I dont recall this area of works being outlined in the original plans they presented to the public. In fact, when they first started filling in behind the Complex, I was told that it was for a "barge ramp" to offload supplies... sounded strange, i said OK. Then I say it extending eastward and thought "hmmm, they are reclaiming land now, but for what?". Now it comes out that this is for additional parking for the expanded cruise pier? Somethings just not adding up, and this project, while it certainly has its good points is being done in a shady manner and we, the voting public, are being kept in the dark. VIP, NPD, PEP, or whoever... we need to hold our Elected Representatives accountable for what they do because at they end of the day they are elected/hired to Represent Us. We can close our eyes, play the fool, and be as political as we want... things will not get any better unless we stop being narrow minded and selfish and demand better from these people. They are NOT better or smarter than us, but they sure are pulling the wool over our eyes and enriching themselves at our expense. This country doesn't need more politicians, just more people to actually care about whats going on and with a vision for the future. Will future generations have positive things to say about us or will they cover their heads in shame? well done! I brought up the difference in plans and reclamation as well. what disheartens me is the plan presented to the public (if it is at all), often changes in reality to a bigger and more problematic development. this is not honest or transparent. Why can't the public be more involved, see the plans as being built, and quit being taken for a ride just because they have the power (and perhaps personal interest). What conservation and fisheries or even the environmental consultant "approved" often gets overridden disregarded. there is no urban planner or master plan consultant- let alone town and country with teeth, (Adams used to work for PA), or even inspectors. Any board in the states would have a 3-D mock up of the plan so a model can be seen. Computer-generated plans are often WRONG. Building procedures around here are truly "mickey mouse".